My youngest, Olivia, LOVES getting into my purse. If it is anywhere within reach she WILL find it and will empty its entire contents onto the floor. Nothing special – regular cotton fabric for the outside, flannel for a soft, cozy inside and some straps. But what does a little princess carry inside her purse? Her cell (OF COURSE), a comb and a Twallet. Wait, what? What’s a TWALLET? A Toddler Wallet of course! 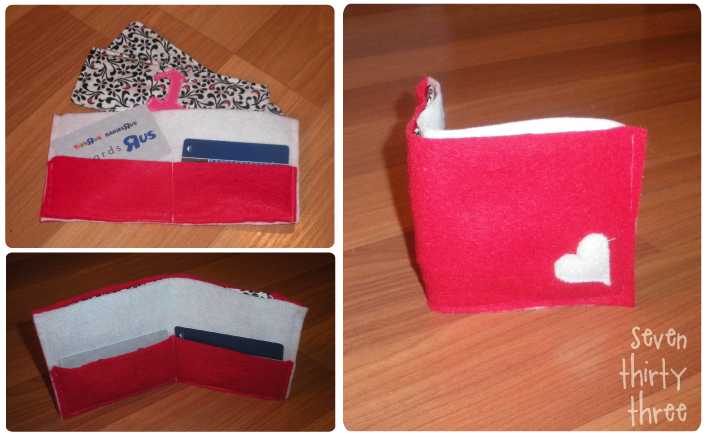 I took inspiration from my felt fairy wallet and made a simple, fold in half wallet with one large pocket for “bills” and two small pockets for her cards (what baby doesn’t leave home without a hotel key and Toy’s R Us Rewards card?). I then put together a few fabric bills using cotton fabric. I appliqued ones onto the front of the bills, added cellophane sandwiched in between the two layers. Sewed them together, leaving a 3″ gap along the bottom. Turn them right side out, top stictch and you’ve got some fun, crinkly bills. « Stop the Pain Please! Oh this is too, too cute! I love that you made the little “twallet” too. Great idea. That is such a cute idea. I love the money you made. I might have to make a twallet for my little man. Would it be ok for me to make one, put it on my blog, and send the credit back to your page? My little man loves my wallet, ok, love is not a strong enough word, he’s obsessed with it! And I got a big box of felt from my mom that I’m itching to use. 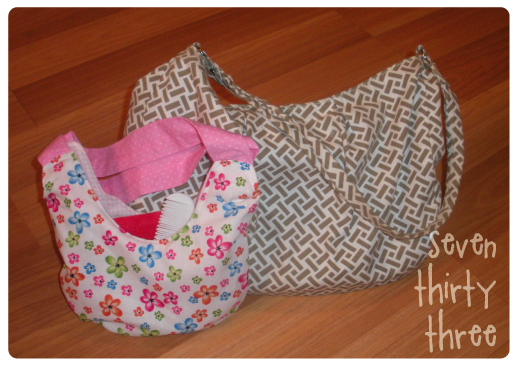 what pattern did you use for your purse in the picture? love that. such a cute idea for little girls. great job. Kim, visiting from Skip to my Lou. Very cute. 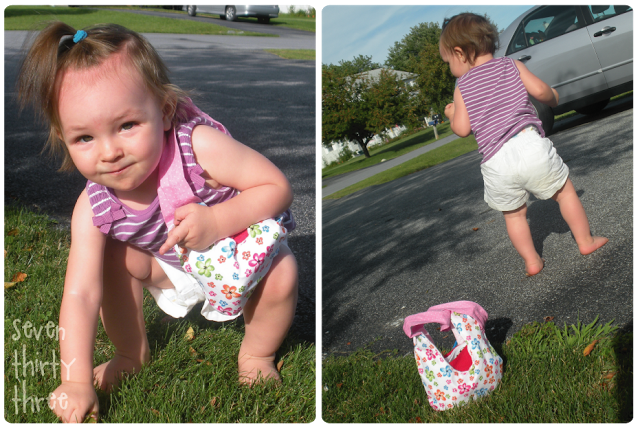 I have a little one who loves purses too. The wallet and money idea would be a great addition to her stash of girlie toys. Thanks for the idea. OH my gosh. I LOVE both of those. I wasn’t following your blog back when you created that adorable wallet but I’d sure love to have a tutorial on both that purse and the twallet. I have a granddaughter that just turned 3 yrs old yesterday that would love those. Every woman must have her purse…she is so cute! How adorable and what a really cute idea. I love that you added the cellophane to make the bills “crinkly”. Your daughter is very blessed to have a mom like you. What a great idea. I love your pretend credit cards for the wallet. I just started following your blog less than a month ago. Thanks for your great posts. Totally cute and funny! Little boys would also love a macho twallet, I need to make one for my nephew. Great idea and totally cute! 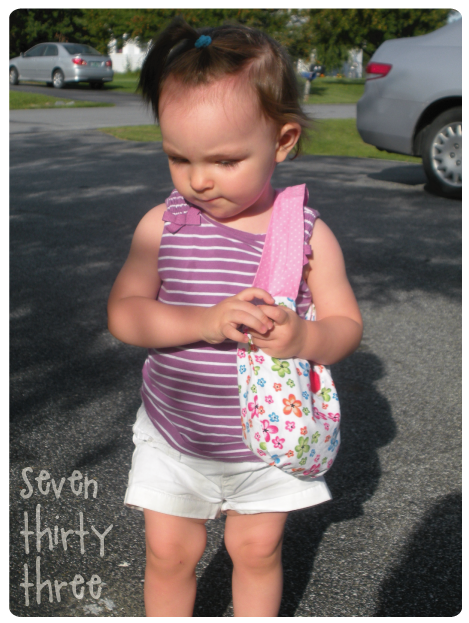 My daughter used to carry around a litte purse. I should have had a twallet for her back then! Thanks so much! I’m also making another one for my little nephew’s birthday. So fabulous.